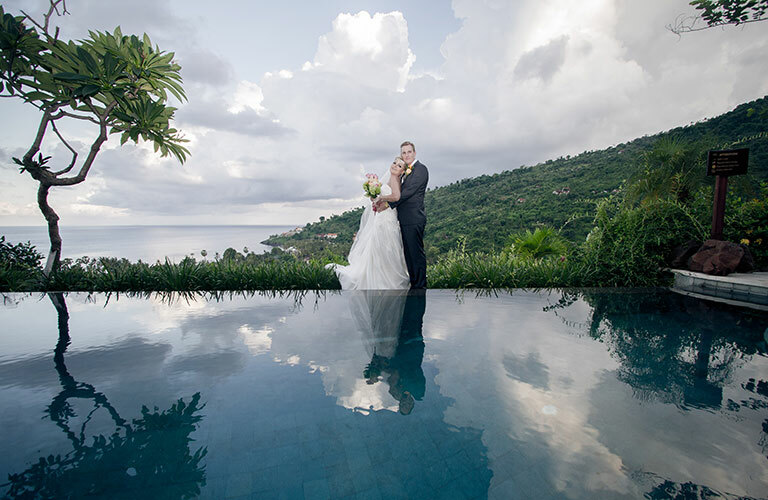 What would be more beautiful venue for your wedding than a lush tropical garden with fragrant frangipanis, orchids and bougainvilleas and the magnificent seaview from the slope of Mount Seraya. Imagine being surrounded by your family and friends, walking an aisle decorated with flowers and exchanging your vows with your beloved one, while the most spectacular sunset decorates the slopes and gilds the shore of the Bali sea. After dusk, millions of stars will light the garden and the pool will be filled with floating candles and flowers. 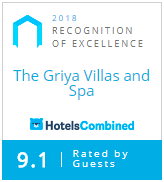 The Griya Villas and Spa offers the perfect setting for your special day. Every detail will be tailored to fulfill your wishes – decoration, food, music, traditional balinese dance or gamelan performances. Whether you choose to have an elegant 3-5-course dinner, buffet dinner or a casual cocktail party, we will ensure that you’ll have a ceremony you will never forget. As the first wedding at the Gyria and not seeing the venue before hand, we were nothing short of completely overwhelmed. The impeachable grounds and the grass cut by hand are just the beginning of our truly magical experience and then there was our wedding. Not a stone left unturned we were organised and respectfully arranged and pampered to a degree that words cannot describe without experiencing yourself. Roma Sirat was and continued to be a support and went to nothing short of a personal advocate and was amazing - nothing was too much, nothing was missed. Impeachable is not a strong enough word to articulate Roma. We had every flower in Bali for our wedding and ROMA assisted with the consulate and all the legalities and all this over email. Words cannot describe how delectable the Gyria is and the charm of Amed. If you want a ceremony or retreat that will leave a impression on you forever, this is the place to go. My eyes well with tears of joy in writing this testimonial and I welcome a personal email contact to elaborate further on how outstanding the Gyria and the team will pamper you beyond belief! With love, respect and a longing to return.